Mysterious Kôr is the first story I read by Bowen and it’s really an amazing story. I read and reviewed Summer Night last year. Unlike so many other short stories I’ve read over the course of a year it has stayed with me or, to be more precise, it’s atmosphere and imagery have stayed with me. The story is somewhat blurred by now. For this year’s Irish Short Story Month I decided to read three stories, each belonging to another chapter in the Collected Stories. Mrs Windermere is among the first stories. The Demon Lover is one of the wartime stories and A Day in the Dark is a post-war story. When you read Bowen you will always find similarities in all of her stories whether she wrote them early in her career or later. The three stories I’ve read are very different but in each you will find lush atmospherical descriptions and a strong emphasis on emotions and mood. There is also an element of mystery in all three of them. A lot is only hinted at, remains a secret. A Day in the Dark, the most complex of these stories adds something new. It has a strong metafictional element. Mrs Windermere is the most playful of the three stories. The mystery lies in the character of Mrs Windermere, an elderly independent single woman who meets a young married woman in the streets. They spent some time together in Italy. The young woman is fascinated and intimidated by Mrs Windermere. Mrs Windermere seems to see through people, reads their lives in the palms of their hands. Not only is she very outspoken, she seems to question the way the young woman lives. Why having married if you could have been free? is what she seems to ask. She senses that the young woman’s life is missing something and tempts her to explore something new, maybe have an affair. A very feminist story for its time. The Demon Lover combines a ghost story with the depiction of war-time London. The result is uncanny. Imagine there is a war and you flee the city, leaving everything behind; your house, your possessions. One afternoon you’re back in London and go to your abandoned house to pick up some things. The house has a ghostly feel, nobody has been there for a long time and it is surrounded by house ruins and other abandoned places. You go from room to room as if you were walking not only through your house but through the life you’ve left behind. And suddenly, someone from you distant past reappears. After having read The Demon Lover I understand why all of Bowen’s war-time stories set in London are either ghost stories or stories with a ghostly feel. Those abandoned houses exude a great loneliness and seem to be creatures waiting for their life to resume. The narrator of A Day in the Dark looks back on her teenage years and tells a story that took place one afternoon, a long time ago. She was a young girl, living with her uncle. She has a crush on him and their relationship is very close. It’s never said that they are having an affair but the possibility of it is palpable. On that afternoon she visits a rich woman. She has to give her back magazines her uncle has borrowed. The woman hints at things the young girl doesn’t understand. It’s a very complex, and multilayered story. The characters are revealed through small hints and descriptions. The way it is written is meta-fictional as the narrator intrudes, points out what could have been described and remembered otherwise. A Day in the Dark is a very dense and mysterious story. Reading it was like eating an exotic fruit for the first time. It’s nice but so strange that one wonders continuously whether one really likes it and why and tries to put into words how it tastes. It’s one of those short stories you could read again and again and would still have unanswered questions, new possible interpretations. I loved it. This post is a contribution to Mel’s Irish Short Story Month. There is indeed something ghostly about abandoned houses, Especially if one once lived there. It is not just the physical aspect no furnishings, there is a strong emotional component to it. Abandoned houses are ghostly. In this case I found it even more ghostly because they were still furnished. it must have looked as if people just left (which they probably did). The stories sound lovely – I have the complete short stories in the depths of the tbr and must dig them out – I like your idea of focusing on just a few as a whole volume feels a little overwhelming. When it’s an original collection I tend to read all of them but when they are Collected Storeis I liked to pick a few from various periods. And she isn’t an easy writer, her stories need a lot of attention and close reading. But that’s nice. Wonderful reviews, Caroline! I liked your descriptions of all the stories very much, but I have to say that ‘The Demon Lover’ intrigues me and I want to read it sometime. I liked very much your description that reading ‘A Day in the Dark’ was like tasting exotic fruit for the first time. The only other place where I have heard the name Windermere is in Oscar Wilde’s play ‘Lady Windermere’s Fan’. It makes me wonderful whether there is an Oscar Wilde connection in Elizabeth Bowen’s story. Thanks for this wonderful review! Thanks, Vishy, I’m glad you liked the descriptions. I hope they put you in the mood to read some of her stories. They are all good but The Demon Lover is very special. I think it would make sense to read all the wartime stories together. Summer Nighty, Mysterious Kor,… the have an intensity I find amazing and the descriptions are wonderful. Thanks so much for mentioning Oscar Wilde. I thought the name sounded familiar put I couldn’t place it anymore. It’s one of the plays I haven’t read so I have no idea whether there is a coonection. I need to read it. Thanks for the suggestion, Caroline. I will try to read Bowen’s wartime stories together. It will be interesting to see whether Bowen’s story has an Oscar Wilde connection. Yes, I hope to find that out. The war time stories have a very special feel and it’s nice to immerse oneself in it. Bowen’s WWII stories are considered her very best work-She served as an air raid warden during the blitz, making sure people were in shelters and lights were out-lots of wardens were killed doing this as they were the last ones to go in shelters as the bombs or rockets hit. Bowen said she never felt more alive than she did in the WWII years in London. You can feel all that when you read those stories or The Heat of the Day. She is wonderful, isn’t she? I also read he Demon Lover a few years ago and remember it being quite atmospheric. I think I also read The Mysterious Kor, but now I think I’d have to go back and look. I am hoping, too, to read a few of her short stories and must get to them soon before the month runs out! Are you enjoying the Gledinning bio? She is wonderful, yes. I couldn’t even say which one I like bets, They are all so good. Demon Liver is special. The idea that so many houses were abandoned. I enjoy the bio quite a bit but I read it very slowly. I would have love to finish it this month as well. You feel that Glendinning loves her a great deal and that’s wonderful. As you know, I’m not a fan of short stories, but these sound wonderful. I could have sworn Mrs. Windermere was made into a movie, but it’s nowhere to be found. I’m mixing it up with something else. I think Vishy is right in his comment, we think of Oscar Wilde’s play. Mrs Windermere’s an or something like that. These are wonderful stories. Some of her short stories are quite long. Love your description of Day in the Dark. After reading The Heat of the Day I’m intrigued by her writing style. Is the discussion this upcoming Monday? No, the discussion is on Thursady 28. I took a while to get into The Heat of the Day but now I’m enyjoing it. You should try some of her short stories if you liked the novel. Thursday, got it. Not sure why I thought Monday. Anyhoos, it took me some getting used to. Much different from what I expected. I think “noir” in her case is misleading. She is a very literaray writer and used a noirish theme but she is by no means a wrier of noir. maybe that was misleading? I found it misleading as well and to be honest I thought I was missing something. Maybe I did. We will see in the discussion what the others thought. I’m only about one third into the novel. great review Caroline. you are talking about short stories but feels like a novel. Your review also reminds me I havent done my Irish short. I have been reading Japanese Author and completely forgot aboit this. She packs a lot into her stories which makes them great but also a bit hard to read sometimes. We can’t join everything we would like to. yeah…I think I am going to pass the event this year. I’ll even have to pass Once Upon a Time altough I love that so much. Just way too busy and I’m going to travel in April. Ooh this warms me up nicely for The Heat of the Day, which I am very much looking forward to. I hope to start it later on today, in fact. Bowen was such a fine stylist I can well imagine that her short stories are very good. The middle part of the 20th century seems to me a boon era for the short story – Scott Fitzgerald, Dorothy Parker, Elizabeth Bowen, right up to Raymond Carver. Danielle’s been reading that Persephone book of short stories lately and whipping up my enthusiasm for it. I do love the short stories based on a story, more than those that are ‘slice of life’ ones. I love slice of life stories as well. More than most others. The descriptions of wartime London in The Heat of the Day are amazing. The combination of beauty and horror. A very interesting book. I’m looking forward to te discussion. Life will always confound us, making us think in ways we’d rather not. Was WW1 just the right time for Wilfred Owen? 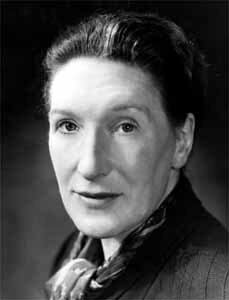 Did Elizabeth Bowen grow as a writer because of WW2 or was she already accomplished? I’ve never taken part in a readalong but I’m very tempted by The Heat of the Day. Earlier stories show us she was already and interesting writer before WWII but I think for some reason the war years brought out the best in her and as I see this confirmed now that I’m reading The Heat of the Day. It would be great if you would join us. You’re very welcome. I was always fascinated by The Demon Lover, the connection to the ballad, the button, the fact that she couldn’t remember his face….. Tropes and symbols and still ambiguous. All of her stories are full of tropes and symbols and there is always some mystery left. You can reread her and will always discover something. I’m ust admit, I wasn’t aware of a ballad. This I overead that?